Feeling stuck? There’s a way out. Do you ever feel like you're stuck in the mud? Like no matter what you do to move forward, you just keep standing still (so to speak)? Speaking straight from personal experience… oh, the frustrating feels of being stuck. It was a rainy day in Paris, but dry inside the quiet cafe. The surroundings were modern and minimalist with an air of vintage French glamor. Quintessential Paris, I wrote, as I sipped my perfectly crafted oat milk latte to the beat of a Sting song. I had ducked into this cafe to write my “morning pages”, a new daily practice I’d recently started that included writing 3 journal pages of anything that came to mind. The practice was so simple, foolproof, there was literally no way to write “wrong” (or right for that matter). There were some rules, however: must write 3 pages, no revisions allowed, required subject - whatever comes to mind. Pre-Paris, I hit a wall. I no longer was clear on my business goals and I wasn’t inspired or motivated to write. I was REALLY stuck. Worst of all, the longer I felt this way, the more overwhelmed I became. I felt like was wasting precious time living in stuck rather than being productive. Being stuck was NOT part of the plan. Perhaps you’ve been here, too. 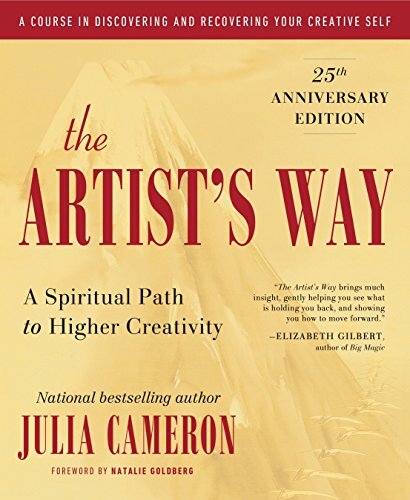 During this stuck period while at a yoga retreat, I overheard a fellow yogi (a painter) talking about a book, The Artist’s Way at lunch. She talking about something called “morning pages” and was hand to heaven swearing this ritual helped her get unstuck and find new ideas for her art again. Wait, what? I almost choked on my gluten-free, vegetarian, yoga retreat salad. So THIS is how you get unstuck? OK, universe. I’ll take your not-so-subtle hint, I thought. So I bought the book and my morning pages practice began. If you want to give morning pages a shot, try waking up a little earlier each morning and write a minimum of 3 pages in your journal. Remember there is no right or wrong way to do this - just write whatever comes to mind. It really is that simple. Make this your sacred time, brew a fab cup of tea or coffee. Your morning pages can be your sacred ritual, your BFF who passes no judgement and who is your ultimate listener. 5 affirmations/goals/dreams that you want to be true. List them in great detail. Before you know it, 3 pages… DONE. You’re well on your way to more clarity (and probably a whole lot more!). Morning pages have really made a difference for me. I can only offer my experience, however if you want 2019 to be your year of action, why not give it a try? Make it a daily practice to write down your goals, hopes, and dreams. The more you repeat what you want to be true, the more magic will happen. Our brains don't actually know if something has happened or not unless you tell it. So, write down your goals and dreams as if they've already happened. And then watch what happens. May this ritual bring you more clarity, peace of mind, and the ability to go through life with more ease (goodbye, mud). Finally, you can take morning pages are oh, so mobile! You can take them wherever you go - Paris cafes (highly recommend this, obvy), the beach, on your next hike. All you need is your journal and a pen. I’d love to hear how morning pages goes for you! Is there another way you motivate yourself to take action? Do you have a daily ritual?